Numerous travel writers and media have listed Crane Beach as one of the world's best beaches and Crane does not disappoint. Indeed, Crane Beach looks like an idealized beach in a travel poster. Situated at the base of a towering cliff, the beach is a wide expanse of powdery white sand that can look pink depending upon the light. Immediately behind the beach is a grove of tall palm trees, which add contrasting color to the scene. Then on the seaward side, the water changes from a pale turquoise to a deep blue. It could not be prettier. 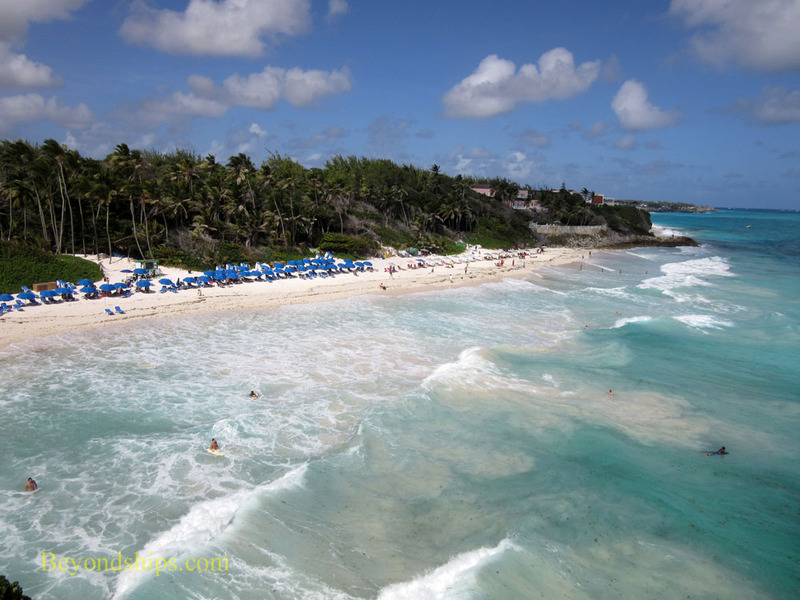 As a general rule, the waters of the Atlantic, which wash up against the eastern side of Barbados, are more turbulent than those of the Caribbean, which lap against the western side of the island. Since Crane Beach is located on the southeast coast, it is subject to the Atlantic. However, a coral reef protects Crane Beach from the full force of the Atlantic. Consequently, while big waves roll onto the beach and there is a current, people do go into the water here. These conditions also make the beach popular with boogie board and body surfing enthusiasts. Above: Views of Crane Beach. Below: Scenes from The Crane Resort.